The story that sweeps from the great Southwest to the Canadian border in VistaVision! An embittered frontiersman engages in an extensive and obsessive search for his niece, abducted years ago by Indians who killed her family in retaliation for a massacre in their village. Before I first saw 1956's The Searchers back in 2000, I'd heard quite a few positive comments about it. Since it reunited John Wayne and director John Ford - who worked so wonderfully together in Stagecoach - I figured it had a lot of potential. Now that I've seen the film, I honestly don't understand the fuss. While the movie seemed mildly entertaining, I couldn't find anything to make it stand out from any of a number of other Westerns in the same era. The film appeared fairly predictable and mediocre for the most part. The Searchers tells the tale of an Indian-hating Civil War veteran named Ethan (John Wayne) who returns to his extended family after the end of the conflict. Soon after his arrival, Comanches lure away the menfolk and attack the farm; they kill some of the inhabitants and kidnap others, which prompts Ethan and some of the rest to pursue them. This becomes a virtual crusade for Ethan and Martin Pawley (Jeffrey Hunter), an adopted nephew who Ethan disavows because he has some Indian blood. The tale follows the two of them as they stalk the vicious Comanche chief Scar (Henry Brandon) who apparently maintains possession of the girls. Such a tale of obsession and revenge should have been powerful stuff, but it feels vaguely bland and unsatisfying here. Much of that results from a genuinely poor performance from Hunter. Wayne was never any great acting talent, but he at least provides a strong presence and can hold his own within the limits of his abilities. Hunter, however, creates a wholly unsatisfying presence and he seems far too broad and emotive for the most part. He really hams it up throughout the story and makes any sense of tension or drama dissipate quickly. Hunter needs to be a more emotional and human contrast to the almost Terminator-esque presence of Ethan, but his bug-eyed over-delivery makes him seem unbelievable and weak. Would The Searchers have functioned radically better with a better actor as Martin? Almost certainly, but I still don't know if I'd understand the appeal. More poor casting affects other roles, such as with Scar. The presence of a made-up white man with blue eyes does not add to the realism in the movie. I've heard comments that blue-eyed Indians existed, and I don't doubt that, but I don't think any of them looked quite so Caucasian. Although Brandon's acting doesn't hurt the film - he has little to do other than glower - the silliness of his appearance detracts from the story. Ford makes the movie look pretty as we pass through some lovely vistas, but I felt little sense of urgency or desperation. The protagonists just seem to stumble along from year to year in their unwavering search for the girls, and not much of interest occurs. Although we do get some taste of the lives they've left behind to pursue their mission, these parts generally are played for laughs and didn't resonate with me. I won't call The Searchers a bad movie, because it's not. However, I did think it was quite mediocre and it seemed disappointing considering the virtually unanimous raves the film receives. From what I saw, it came across as nothing more than just another decent Western. 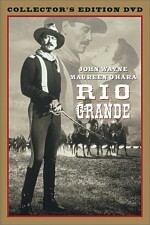 The Searchers appears in both an aspect ratio of approximately 1.85:1 on this single-sided, double-layered DVD; the image has been enhanced for 16X9 televisions. I found it hard to believe they filmed The Searchers 50 years ago, as this transfer made it look brand new. Sharpness seemed very strong. Barely a smidgen of softness ever cropped up as the film progressed. Instead, the movie looked concise and crisp at almost all times. The image showed no jagged edges or shimmering, and only a slight hint of edge enhancement occurred. Print flaws were virtually absent. I saw only a couple of very small specks. Indeed, these were so minor that I needed to re-examine those parts of the flick to confirm their existence. For all intents and purposes, the film came with no source defects. Despite the arid, dusty setting of The Searchers, colors looked excellent. A brownish tint dominated, but the film still found opportunities for brighter tones. When these appeared, they stood out in a terrific manner. The various hues were rich and full. Black levels appeared dark and deep, and shadow detail usually was appropriately heavy. At times low-light shots could look overly thick, but those occasions occurred due to "day for night" photography. Hat technique almost inevitably results in dim shadows, so I couldn’t fault the transfer for the problems that came from the source. Really, I couldn’t fault the transfer for much of anything. I found it to provide a consistently fantastic image that should absolutely stun fans. I don’t know if the flick ever looked this good. The film's monaural soundtrack seemed more than acceptable for its age. Dialogue appeared a bit thin at times, but was fine given the restrictions of the era’s technology. Lines always sounded acceptably crisp and lacked any edginess or problems with intelligibility. Effects were reasonably accurate. No distortion popped up as the elements appeared pretty clean and firm. Music might have been a little bass-heavy, but the score was fairly solid. Those aspects of the track seemed smooth and full when I factored in the age of the material. Some background noise could be heard during the film but not to a terrible degree. Overall, the sound seemed pretty solid for a film of this one’s vintage. How did the picture and audio of this 2006 DVD compare to those of the 1997 release? Both offered clear improvements. The audio seemed tighter and lacked the distortion and other concerns of the original track. The visuals were a tremendous step up in quality. In place of the dirty, fuzzy, pale presentation on the old DVD, the new one provided a stellar image. The 2006 Searchers looked and sounded much better than the 1997 DVD did. Whereas the prior disc lacked significant extras, this “Ultimate Collector’s Edition” includes many pieces. On DVD One, we start with an Introduction from Patrick Wayne. John Wayne’s son chats for one minute, 51 seconds as he tells us a little about his dad, John Ford, and the film. This ends up as a general piece without much value. In addition to the movie’s trailer, Disc One also presents an audio commentary from filmmaker Peter Bogdanovich. He offers a running, screen-specific discussion. For the most part, Bogdanovich offers annotated narration. 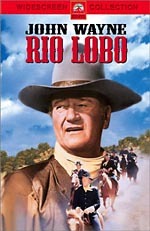 He tells us a little about John Wayne, director John Ford and other cast and crew. He also chats about the movie’s story and themes, cinematic techniques, and locations. The best parts come from his memories of interactions with Ford. However, Bogdanovich often does little more than describe the action along with a few minor thoughts about what he sees. He provides the occasional insight but not much more than that. We get a fair amount of dead air, so this turns out to be a lackluster commentary at best and a dull one at worst. Over on DVD Two, we begin with The Searchers: An Appreciation. This 30-minute and 55-second documentary features the standard mix of movie clips, archival materials, and interviews. We hear from filmmakers Curtis Hanson, Martin Scorsese and John Milius. During “Appreciation”, the various filmmakers discuss their early encounters with Searchers and comment on various aspects of the flick that impressed them then and now. They also discuss technical elements of the film and give us a dissection of the different parts of the flick. This means that talk about technical issues as well as character, story, and tone. In addition, they dig into subtext, themes, interpretation and allusions as well as reflections on director Ford and racial issues. “Appreciation” offers the kind of discussion I thought we’d get from the commentary. The filmmakers show their obvious affection for the film as they open it up to interpretation and dissection in a number of ways. Though their opinions still don’t make me think highly of the flick, I like hearing how they feel. Next comes A Turning of the Earth: John Ford, John Wayne and The Searchers. A 32-minute and 55-second documentary, it presents notes from Milius, Patrick Wayne, director’s son Dan Ford, and actors Pippa Scott, Harry Carey Jr. (read by Peter Rainer) and Lana Wood. Note that they don’t appear on-camera. Some of the material comes from a narrator, and the other participants show up as voice-overs as well. “Earth” looks at the story that inspired the film and its path to the screen. We follow the location scouts, shooting in Monument Valley and facts about that area. From there we learn about story influences, the atmosphere on the set, performances, and filming various scenes. The show progresses through Ford’s work and his relationship with Wayne, stuntmen and the use of Navajo. “Earth” acts as a somewhat unconventional documentary, but it proves fairly satisfying. It doesn’t light upon all of the issues I’d like, but it gives us reasonably good insight into the areas it discusses. I admit I could live without some of the jerky shots and odd transitions; why’d the documentary’s producers try to make it look like the opening credits to Se7en? Though we see too many movie clips for my liking, there’s enough useful content and interesting shots from the set to make this one winning. Some vintage elements come via four Behind the Cameras featurettes. These include “Meet Jeffrey Hunter” (four minutes, two seconds), “Monument Valley” (6:02), “Meet Natalie Wood” (5:49) and “Setting Up Production” (5:54). Originally aired as part of a mid-Fifties television show called Warner Brothers Presents, all of these present some details from the set of The Searchers. None of them are terribly fascinating, but they provide a fun look at TV promotional materials of the time. “Valley” and “Production” are probably the best since they give us some decent material from the set. The other two are little more than excuses to show lots of movie clips. DVD Two ends with a trailer for an upcoming Western called The Assassination of Jesse James By the Coward Robert Ford. Saddled with an awfully awkward title, this flick stars Brad Pitt. Would just The Assassination of Jesse James be a better title? A few paper materials pad out the “Ultimate Collector’s Edition”. These come in two separate folders. The first includes replicas of two memos along with 10 4”X6” black and white photos from the set. There’s also a coupon you can redeem for a free 27”X40” copy of the original movie poster. Inside the second package, we discover a replica of a Fifties comic book adaptation of the film as well as a text that presents many advertising materials created for the flick’s theatrical release. The photos aren’t exciting, but everything else here is quite cool. Does this “Ultimate Collector’s Edition” omit anything from the original 1997 DVD? It drops some basic “Cast and Crew Biographies” as well as a few text production notes. None of these elements go missed. My opinion may fall in the minority, but I just wasn't impressed with The Searchers. When I first watched the film and offered that impression, I got e-mails that told me to view it again. I’ve now seen The Searchers three times and nothing’s changed my opinion. I simply found nothing of any great interest or depth in this film. However, I did really like this terrific “Ultimate Collector’s Edition” of The Searchers. The new transfer looked terrific, and the audio was quite good given its age. While many of the new extras aren’t great, they help educate us about the flick’s creation and history. I don’t know if I’d call this the “ultimate” look at The Searchers, but it serves as a pretty solid DVD. Pursestrings note #1: Warner has created two separate 2006 DVD versions of The Searchers. This review covers the “Ultimate Collector’s Edition”, a set that lists for nearly $40. You can also purchase a “50th Anniversary 2-Disc Special Edition” that retails for about $27. What does the extra $13 buy you? The “Ultimate Collector’s Edition” adds the two folders of paper materials I mention above; all of the disc-based pieces appear in both sets. As cool as they are, $13 seems like a lot for what it gets you. If you’re a Searchers die-hard, you’ll want the more deluxe package. I think most people will feel satisfied with the cheaper 2-disc SE, though. One or the other deserves the attention of viewers, though. New fans should pursue one of the 2006 releases instead of the old 1997 edition, and I definitely think folks who own the prior disc should upgrade to one of these. Even if you don’t care about supplements, the improvements in audio and especially picture make it worth your while. 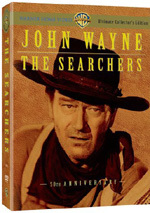 Pursestrings note #2: this “Ultimate Collector’s Edition” of The Searchers can be purchased on its own or as part of an eight-movie “John Wayne-John Ford Film Collection”. 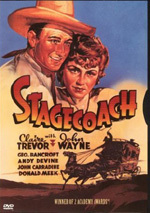 In addition to The Searchers, this box includes Stagecoach as well as They Were Expendable, She Wore A Yellow Ribbon, 3 Godfathers, Fort Apache, The Wings of Eagles and The Long Voyage Home.